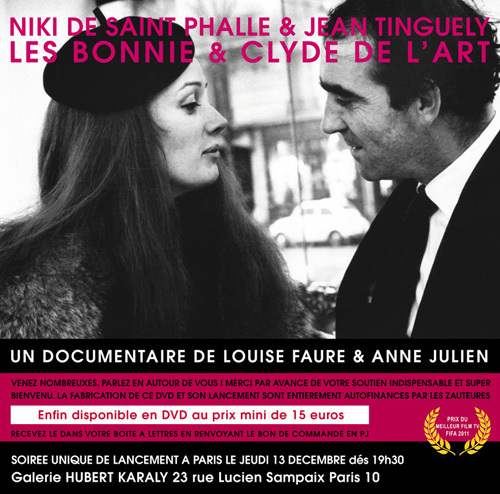 The documentary film by Louise Faure and Anne Julien, “Niki de Saint Phalle & Jean Tinguely: Les Bonnie & Clyde de l’Art,” is coming out on DVD — and to celebrate, there will be a launch event in Paris on Thursday 13 December at Galerie Hubert Karaly (23 rue Lucien Sampaix, 75010 Paris). The evening begins at 7:30pm. “Les Bonnie & Clyde de l’Art” won the Prix du Meilleur Film TV FIFA 2011.